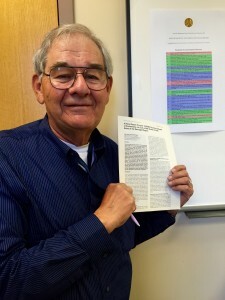 Rupp poses with the article he and Sancar published. Image courtesy of W. Dean Rupp. received the highest honor in his field: the 2015 Nobel Prize in chemistry. Sancar shared this award with Tomas Lindahl and Paul Modrich for their wide-ranging “mechanistic studies of DNA repair.” Specifically, Sancar was recognized for his discovery of how multiple enzymes work together during a process called nucleotide excision repair to fix DNA damaged by ultraviolet radiation in human and bacteria cells. 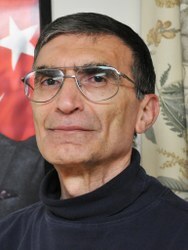 Aziz Sancar is currently a professor of biochemistry and biophysics at the University of North Carolina at Chapel Hill, where he continues to study the mechanisms of mammalian DNA repair. Image courtesy of the UNC School of Medicine Biochemistry and Biophysics Department. From 1977 to 1982, Sancar worked as a postdoctoral fellow in professor W. Dean Rupp’s radiobiology lab at Yale. During this period, the researchers studied UV-sensitive bacteria strains and discovered that certain enzymes make two incisions surrounding the UV-damaged region to eventually release it. A previous model for excision repair purported that only a single cut was made. “Up until that point, the method that everyone believed was that [these enzymes] only made a nick in the DNA, and then other enzymes came along and removed it,” Rupp said. Sancar’s revolutionary dual incision discovery in bacteria allowed him to later elucidate the more complex repair mechanism in human DNA. Regarding Sancar’s Nobel Prize, Rupp explained that the primary significance is the discovery of the bimodal incision, which Sancar determined in Rupp’s lab. Sancar’s findings expand upon the DNA repair research that has been conducted at Yale for decades. Now, he continues this work as a professor at the University of North Carolina. Cover Image: Dr. Aziz Sancar was awarded the Nobel Prize for discovering how DNA ligase, shown here in blue and yellow, seals nicks in damaged DNA. Image Courtesy of Wikimedia Commons.